Babies at Greater Risk to Environmental Exposures - Do You Need an Air Purifier? We often think of air pollution as being outdoors, but the air in your house or office could also be polluted. Sources of indoor pollution include biological contaminants like mold, pollen, bacteria and dust mites, tobacco smoke, household products and pesticides, gases such as radon and carbon monoxide and building materials such as asbestos, formaldehyde and lead. 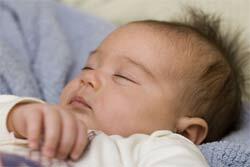 When sleeping, your baby’s respiratory system relaxes just like the rest of her body does. Her relaxed body can’t cope with all of the things it handles when it is fully awake. This means your baby is more susceptible to allergens and toxic exposure. Your baby’s immune system is directly affected by the air she breathes. Her lungs and immune system are resting and getting refreshed when she is sleeping. To ensure that your baby has the best start possible, give her the best and healthiest air possible. An air purifier or air cleaner is a good way to protect your baby by reducing the pollutants in her nursery as well as the whole home. The room air is drawn into the purifier and contaminants are trapped. Because of baby’s vulnerability while sleeping, it is best to keep your purifier in baby’s room. Make sure that it’s at least 4” from the wall so that air can be freely drawn into all sides of the cleaner. Babies also find the quite white noise relaxing. There are several types of air purifiers on the market. Some models are made for one room while others cover the whole house. The two best types are filter types and electrostatic precipitators. Each has its advantages. Filter types are best for trapping dust, pollen, and smoke without emitting ozone, which can be an irritant. There are many types of filters including HEPA, activated carbon and antibacterial and germicidal filters. Electrostatic Precipitators attract particles to a plate by creating a charge. They typically do fine job of removing dust, pollen, and smoke, but all create some ozone, which can aggravate asthma and decrease lung function. The main advantages of electrostatic precipitators is cost and the fact that the plates never have to be replaced, although, cleaning the plates can take more time than changing a filter. > Keep your baby away from smoke, both inside and outside the home. > Dust, mold, certain household pests, secondhand smoke, and pet dander can trigger asthma attacks and allergies, so keep your home as clean as possible. > Limit outdoor activity on ozone alert days when air pollution is especially harmful. > Limit motor vehicle idling.